Home » Incometax » Income Tax Search survey and raid – What to do? 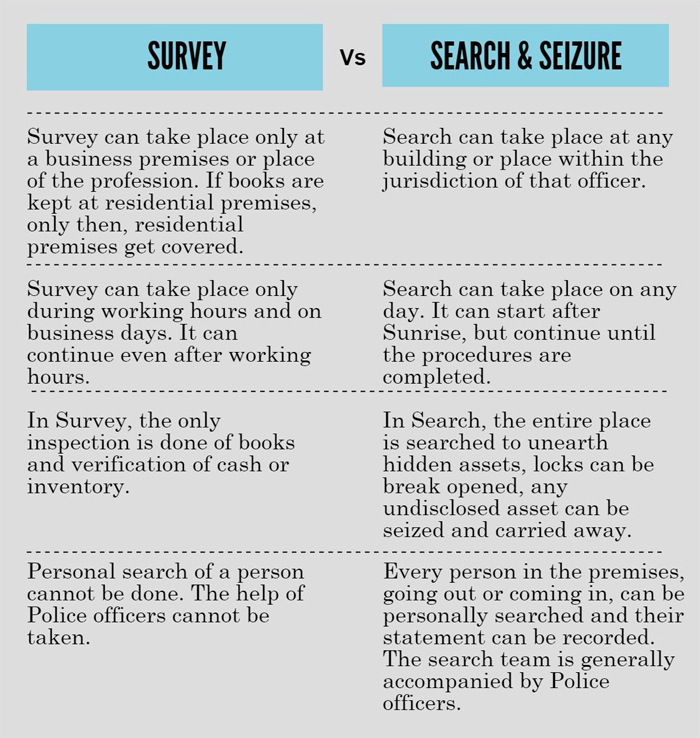 Be Cautious and get ready for Income Tax search survey scrutiny or raid. In past few days if you have deposited a large amount of cash in your account, if you have done high-value transactions or if you have opened fixed deposit, a current account without PAN card, earned capital gain via penny stocks, taken bogus loan entry or donation than you are under scanner of Income tax department. You are likely to get Income tax notice and in case you are unable to give a satisfactory answer to notice you may face Income Tax search, survey or raid. What to do in case of Income Tax Search, Survey or Summons? Income Tax raid or search operation is one of the worst nightmares for anyone. Some reasons for the fear during the raids are heavy tax, penalty, and mental harassment etc. The impacts of the income tax raid are unavoidable. However, this impact can be minimized if you have knowledge about process. If you come across similar situation don’t get panic check following things carefully. 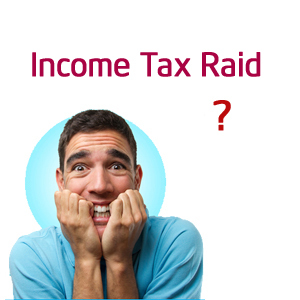 Find out under which section income tax search or raid is conducted. Name and address mentioned on notice are proper or not. After checking above aspects allow income tax officer with proceedings. Do’s, don’ts and important information about Income Tax summons, search, survey & raid are given below. Income Tax survey under section 133 is carried out for the following purpose. a) To verify books of account, stock & cash at the place of business & record statement. b) To obtain details of expenditure incurred at a function/program etc & record statement. c) Survey to collect information. Under section 133 officers are not allowed to do any search operation at your house, shop or office. They can only check account books, stock & cash. After completing survey they can take your statement of confirmation. Income tax officer can impound your books of account or papers. Remember to take a copy of your statement. You have a right to do so. If your home address and office address is same they can come to your home for the survey. They cannot break any lock or cabinets. However, they can ask you to open it. In the case of summons, search or survey you should give your statement carefully with a peaceful mind. Don’t give any false statement under pressure or stress. Do write your statement in your own language. Instead of writing surrender, confession or admission in the statement you should write that I will be able to answer after checking records carefully. It is seen that during Income Tax survey officer will allow you to take help of expert CA. You should call a known and trustworthy CA else you will face difficulties at a later stage. Be polite and keep patience during the process. Please assist Income tax officer during the survey. Don’t use abusing language. Also Read – How to deal with Income Tax Notice? Income Tax summons under section 131 is issued under following circumstances. a) There might be some case pending before officer against you. b) For the case of any other person, your presence is required. Under section 131 you will be called at income tax office by officer along with the document to record your statement. The summons is to examine you under oath, compel production of books or account and documents. If summons is issued and served on a person for personal attendance under section 131, it is binding on him to attend in person. He cannot be represented by a lawyer, CA or an authorized representative. It is advisable to hire a CA or Advocate who is practicing in Income Tax matter before appearing for summons. Non-compliance with the summons / notice issued under section 131 may result in levy of penalty of rupees 10,000 for such a default. Income Tax Search or raid is conducted for following reasons. a) If you are unable to give a proper answer to the notice issued under section 131(1) or 142(1). b) If Income tax officer knows/believe that you have unaccounted/black money, property or jewelry. c) In case someone gives proof about your unaccounted to income to Income Tax. In the case of an income tax search first step is to check and verify ID of officers carefully. You can confirm the authenticity of the officer by dialing control room number specified in the search warrant. You can call two neutral persons to witness the entire process. You have right to call your CA but he cannot interfere in the search process. He can help in records verification. Under Income Tax raid officers can search your office or house. If you or any family member is facing any medical issue during the process you have a right to call a doctor. You can follow a normal routine during the search process. You can sleep at a night time and you are authorized to send your children to school. The search operation may continue for a longer duration as main intention of the raid is to find out unaccounted income. You need to give an explanation about amount written on every single papers or document. So, it is advisable to scrap lose papers once work is over. If any cash amount is found in your office or house you need to produce evidence like cash payment receipt or cash withdrawal documents. You have to give an answer for the unaccounted gold found at your place. As per rule married woman can keep 500 gm gold and man can keep 100 gm gold. In the case of unmarried woman 250 gm gold is allowed. If you have extra gold jewelry you have to keep invoice along with proof of payment from your accounted income. Income tax officer may check your computer, USB pen drive or laptop. If you are keeping accounts of books on your computer make sure to reconcile every entry. If possible delete unwanted files from your computer. Apart from computer make sure to check your mobile phone regularly. Delete unwanted SMS, money transaction related Whatsapp Chat or e-mail correspondence. Whenever you are purchasing any valuable assets like car, jewelry, TV etc. make sure to keep payment invoice aside. Remember in Income tax raid you have to give an answer about every valuable asset. You are not supposed to give clarification about any asset purchased before 6 years. However, you need to prove that mention asset was purchased before 6 years. Make sure not to keep any foreign currency at your home or at an office. In income tax raid officer can seize unaccounted cash, jewelry, locker, promissory notes, cheuqe, draft, property documents etc. In addition to above, they can also confiscate computer hard disk, pen drive, CD, DVD, Mobile phone etc. Income tax officer cannot seize your house or property declared in income tax return or under the book of accounts. I hope the information given above will be helpful to you during Income tax survey or search operation. Have you been to the situation of Income tax raid or search operation?